When selling digital goods, be they PDFs, photos, art, icons or anything else where a download completes a transaction, creating an online store can seem complicated. A Google Checkout Web Element, released last year, simplified things a bit, but a new entrant, hacked up over this weekend, makes the transaction for posting and delivery as simple as a link, with no need to ever create a custom store. The solution, which is raw, but shows potential, is called Gumroad. The project of Sahil Lavingia, who is better known for his work on iOS apps like Dayta and Color Stream, was cooked up with the aim to let friends send simple links to each other over sites like Facebook and Twitter, and recognize real revenue from the transaction. So long as the seller has an e-mail account associated with PayPal, there's hardly any setup required. To start selling digital assets with Gumroad, you need to set up a user name and password, and then you can post links to your digital goods, assigning prices, title and description. Once you share the link, users can buy the goods, and the money, minus a cut that isn't yet finalized, will be deposited to your PayPal account. I tested the service this morning, posting links for a set of PDF'd comics I made of Oakland A's players from 2005 to 2008, and also the FTC disclosure icons Jeannine Schaeffer made at the end of 2009 for bloggers with conflicts. Try both links - they lead to Gumroad, and if you want the full set, it could cost anywhere between 2 and 3 bucks. It's very easy. If there are questions about this service's usability, they become like those on other payment systems. 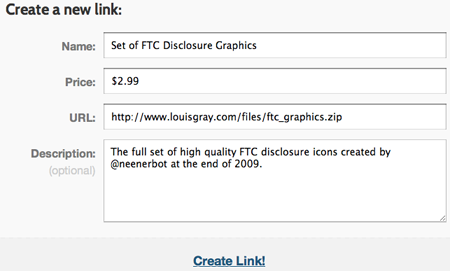 If I get the eventual URL for the digital asset, why not pass it around for free? Why not upload that asset to a peer to peer (P2P) service? And why should I trust this service with my credit card data and secret code? They may use HTTPS, but the service could do more to make me comfortable to do transactions. It's also not clear how fast money gets deposited to PayPal. All those caveats aside, it's an interesting experiment by a known developer who is trying to think of new ways for us to do transactions with one another simply, much like eBay, PayPal and Square have. Check it out at http://www.gumroad.com.